Another Childhood gluebomb!! I loved this one when they re-issued it, only my skills (and attention span) were not up to par. A nod to E-bay once again, only these kits are hot, and I had to bid on several before the Post Office brought me mine! 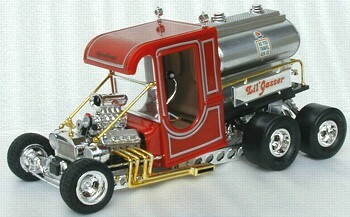 I painted it with Testors Red, and used Krylon Chrome on the tank. It is the best silver paint I've found. 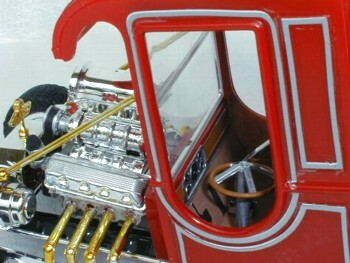 I am appalled at all the bright work, yet they didn't chrome some of the engine parts, including the VALVE COVERS!! What's up with that? Parts box to the rescue. Also, the kit came with anodizing, but after ten years in the box, it was dried up. I tried to revive it with water, but it was no use. 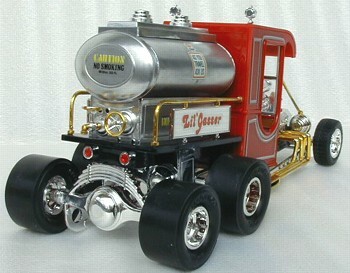 A huge thanks to Terry Onda for the Gasser kit he sent me, as it had good quality "anodized" parts I could use! These decals can be tricky as well, and I found a Q-tip makes an excellent squeegee for pinstripe decals.